To join the VIP for the webinar: send questions to 30webinar@gmail.com, with the title "VIP" by 17th of May and join the Vip list! 3. 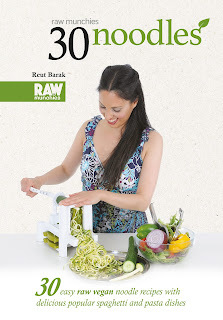 Win a free signed copy of 30 Noodles! The best burning question wins! Do you loose weight on a Raw Vegan Diet? What are the most healthy supplements? Can you name some raw vegan celebrities? Does the raw vegan diet anti-age? Do you actually become younger? Can we get some free Noodles Tricks? What is the healthiest Exercise? What about the protein on a raw vegan diet? How do I eat out when I’m raw vegan? How do I impress my friends on a raw vegan diet? How do you work on self image and confidence? In a food processor or high-speed blender, blend the Dressing ingredients until smooth. Chop cabbage, pepper, mint, and parsley, and mix with the rest of the Vegetables ingredients. Wash the Kelp noodles well. Mix with the vegetables. Add the Dressing. Garnish with chopped avocado and chili flakes. This sounds like a great book and a great gift for my sister I believe.